Canberra developer Geocon plans to redevelop the Woden Tradies Club site into one of its trademark high-rise apartment precincts after buying the property for $16 million. 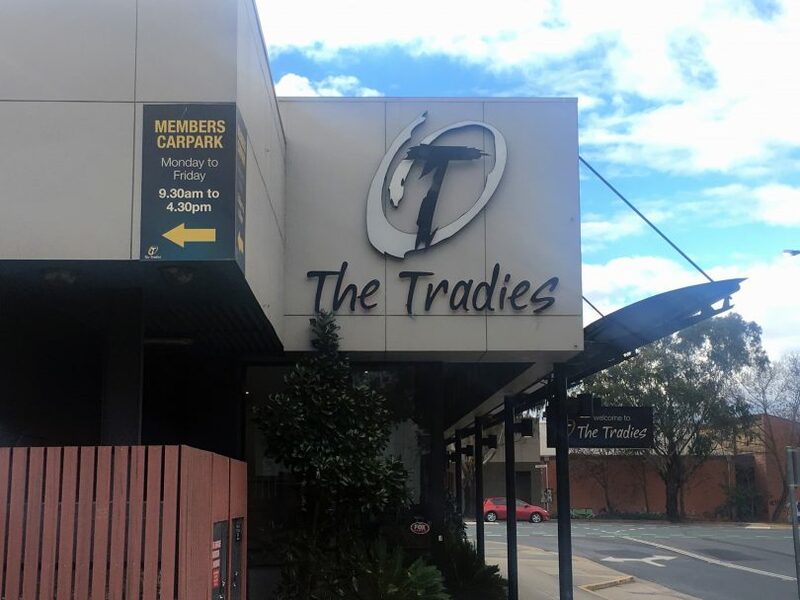 The Tradies Group accepted an unsolicited offer for the site, which is bounded by Launceston Street, Melrose Drive and Furzer Street in Phillip and occupied by the club, Quality Hotel and an adjacent car park. Chief executive Rob Docker said the decision to offload the property and close the club and hotel was made with a heavy heart but the Woden club had found it very difficult to make ends meet and would now close in January. “The club has found it very difficult, given its size, to compete with the Hellenic Club and Southern Cross Club in that location,” he said. The Woden Tradies has been part of the area’s entertainment and hospitality scene for nearly 50 years since it opened in 1969. But its membership of a little more than 10,000 is dwarfed by that of the other clubs. They will be absorbed by the sister club in Dickson. Mr Docker said the club industry in general was suffering from declining patronage and increasing competition from restaurants and hotels. Although the hotel was making money, the Tradies board believed it would be too difficult, given the amalgamated nature of the site, to continue with that business and close the club. Mr Docker said the sale gave the Tradies the opportunity to focus on its Dickson operations and plan for potential redevelopment there. No decision had yet been made about the Woden club’s gaming machine authorities, including whether to sell them to Casino Canberra. He said he hoped most of the 60 staff, mostly casuals with about 10 to 15 permanents, would go to Dickson but there may be some redundancies if that was not possible. “We’ll be working very closely with United Voice, the union for hospitality workers. Together we’ll be very attuned to all the HR issues and most definitely we’ll err on the side of generosity, particularly for those people who have worked for us for a long time,” he said. Mr Docker said a retraining fund would be set up and counselling made available. The site is ready-made for redevelopment with the blocks amalgamated and lease varied some years ago at “some great cost” when the previous Tradies administration had submitted various development applications. Geocon said it was expanding its focus on Canberra’s main town centres after the recent acquisition of the City 7 site in Reid and the announcement of an expansion strategy into regional NSW for its Abode Hotels brand. Managing Director Nick Georgalis said its only presence in Woden was the Abode Hotel in Bowes Street, where it converted the old Juliana House – a 1970s public service office building – into Australia’s first green-star rated hotel. “The one-hectare Furzer/Launceston Street site presents another excellent opportunity for a Geocon trademark precinct-style development, and with last year’s announcement that the next phase of the light rail will extend south from the city to Woden, this town centre has great appeal for us,” he said. Mr Georgalis said the hotel would continue to trade while planning for the mixed-use, high-rise precinct got under way. “While the sale will be finalised next year, a new project in this location aligns with our commitment to meet the increasing demand for quality apartments in Canberra,” he said. Woden Valley Community Council president Fiona Carrick said she was concerned at the loss of local jobs, and would be seeking to ensure that any residential development considered the needs of the community and was not simply about building height and yield for the developer. Geocon has 1,500 apartments under development across Canberra this year, with another 3,000 in the pipeline, all in the major town centres or on the light rail route. Its Abode Group is the ACT’s largest hotel brand with 400 hotel rooms under management, another 600 in the pipeline, and expansion plans across regional NSW. Are you a Woden Tradies member or former member? Tell us what you think about its demise and any memories you may have? Is an another apartment complex good for Woden? I wonder how much taxpayer money is going to be spent to make that intersection safe – there are smashes there on a regular basis. A lot less than would be spent if more urban sprawl connected by more and wider freeways were to be constructed. But yes sad to see the club close. But no freeways are being constructed are they. Only a not-needed and unaffordable, inflexible tram network which can only be accessed by people who live near it. Great outcome. I’ll miss the club too – food was consistently good and beer excellent. Staff friendly but finding a car park lately has been a problem. Where have all the car parks gone? Ignoring Gungahlin Drive and Majura Parkway hey? I think they already exist, JC. Tradies holds a special place in my memory. When my father died in 1999 my mother said that she and him regularly went to the 83 Restaurant (all you can eat) on the upper level of Woden Tradies. I took her there the following Friday and so began a tradition that spanned the decade of the Noughties. Christmas lunch there was special. Prawns, oysters, and on one occasion lobster and scampi. There was Christmas cake and Santa would arrive in the afternoon. I’ll never forget being there with my late sister and her husband enjoying the good times. I would give everything to have her back and to enjoy Christmas lunch again like we used to. In April 2009 the 83 Restaurant closed down abruptly. We were booked in for dinner there the following Friday. The excuse given to me over the phone for the closure was hygiene. I said that we would never again walk into Woden Tradies again. Our membership lapsed and we instead went to the Hellenic Club, Belco Labor Club and the Burns Club. I’m not surprised that the conversion of the 83 space into another pokies hall failed and that Tradies began losing money as a result. Clubs in Canberra are discovering that if you have a good and popular restaurant popular with families, you don’t need to rely on the pokies for revenue. I really do believe that if another all you can eat buffet had been installed in the upper space, Woden Tradies would still be viable and could remain open but management decided to head in a different direction. The huge tower blocks that will replace it will bear testament to that tragic folly. Interesting comments there about Restaurant 83 which was one of 11 throughout NSW and the ACT operated by “83 Restaurant Franchising Pty Limited”. There was also one at the Labor Club at Belconnen. Most were in the Newcastle/Hunter Valley area and the Central Coast. I don’t recall any official reason being cited by the ACT Government health department about the closures but I am led to believe that it wasn’t hygiene but the visa status of the people working there, not unlike the recent revelations about another franchise operation with numerals in their trading name. I wish they’d buy and redevelop the Albermarle and Alexander buildings instead; despite the much-needed whiff of urban decay they provide. It is a shocking eyesore isn’t it….. I work right near there – with 2 multi-story residential complexes just completed on Irving Street (next to the swimming pool) and now another multi-story complex going up on Furzer Street it is going to make the Furzer/Launceston Street intersection more dangerous than it already is. I would have first hit the Tradies in the winter of 1980. I had just shifted into Waramanga and needed a water hole. I remember one of those nights when there was a stocky bloke selling records of his days on the snowy mountain scheme. It was of course Ulick O’Boyle and it was one of a number of LP’s that Ulick and the Settlers Band recorded. I got to know Ulick better at the Henry Grattan Tavern. Would be safe to say that everyone got to know Ulick better at the Grattan tavern. Towards the weekends the Tradies would fill up. There was a good gathering of Action bus drivers present, as a number of them lived across in Lyons. There was also a small contingent of Canberra Times people, who were on the production side. Also a goodly swag of public servants as across the road was the regional office of the Department of Works. There would be a band occasionally. One I can remember is Southern Comfort, and one of the band members was a big bloke who drove a yellow earth moving machine out at the Mugga tip. I have a 45 somewhere put down by them. Old Bill behind the bar raised chooks which he used to show at the local show, and also around the southern tablelands. Anita was on the door. The Chinese restaurant was called the Chintu or possibly the Chin-Tu, where I first started to find my way around a Chinese menu. Up until then I was bamboozled by a menu so always went for safety; chicken chow mein . I was a regular of the club until 84 when I shifted down south. Have a lot of memories of the joint. Must go back before they pull the curtain down. Gosh, I can remember when there was a house on that site. More proof of the farce that is clubs in Canberra. Were the board actually representing the interests of their members they’d never shut down a profitable venue without a plan for an equivalent replacement nearby. It is high time “clubs” stopped getting special treatment and were treated like any other business.